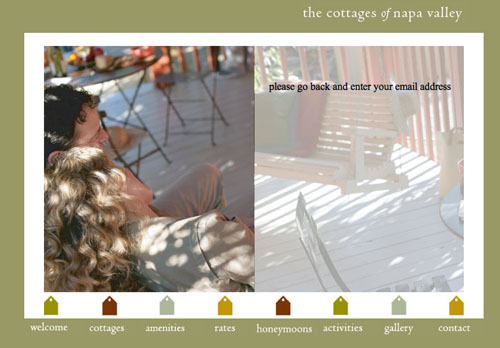 You missed it for Valentine's Day but it isn't too late to plan a romantic getaway in Napa Valley at the Relevant Tool's customer Napa Cottages. 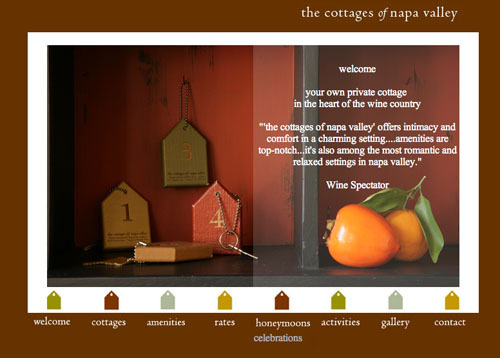 While you are dreaming about relaxing in the Wine Country you can learn about how Napa Cottages uses custom response pages for their contact form and how you can personalize the response pages for your own Relevant Tools web forms. Use Relevant Tools to set up your web forms, selecting the fields that you want. VIP customers have the option to enter a web page on their website to be used as a response page as well as a missing fields and error page (usually the same page). If you don't enter your own web pages here the standard Relevant Tools web pages will be used with a link back to your web site. Relevant Tools will generate the form code for you to install on your website. You can customize the look and feel of the form to match your website. Your website visitor fills out the form. If any required fields are missing the missing fields page will be displayed with the list of missing fields. The user can go back and make any corrections required. Now when your website visitor completes the form they receive a customized response page. It is easy to set up and if you have any questions or need technical help, Relevant Tools is here to help you with the details.